Ahoy my thrillers, killers and seat-fillers. With our 100th episode creeping upon us, I thought I’d let everybody know what’s on the agenda right now. Before No. 100 gets the greenlight, I feel it necessary to go back and finish up No. 93 and 94 first, so the currently “lost” episodes will soon be “found”. I also have a very specific movie in mind for No. 101, so don’t be surprised if this month’s killer clown flick gets bumped back to April to serve my own twisted purposes. Speaking of April, we’ll be taking part in a roundtable review event on April 2nd, so there’s some more fun to look forward to. Outside of the normal site shite, I’ve got two other projects in the works. 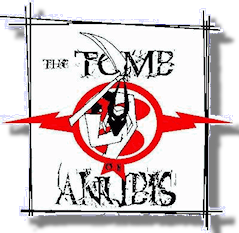 One is a small compilation of reviews from the Tomb’s past to be digitally self-published through Amazon, which will be available once I’m finished editing (and in some cases, heavily overhauling) said reviews. The other is… still not something I’m 100% sure I’ll be doing, but if I do, I’ll be posting about it further here in the coming weeks. That’s all for now, folks! Time to get back to wandering the cobweb covered halls of my festering mind in search of some gold among the mold. Auf wiedersehen, mein welpen!